Sometimes one can feel pretty stupid. Sometimes deservedly so. Last week I posted a blog about petrichor, an aroma that I like many others find entrancing. Two nights ago I experienced a less pleasing odour. I was preparing an excerpt from a novella I’d drafted earlier this year so I could submit said excerpt to a NAWG competition, and I wanted to finalize and submit it (online) – and have dinner – before leaping into my car to drive to Chapel-en-le-Frith to contribute to an open mic evening compered by my author friend Margaret. So while I worked at the novella excerpt I’d extricated some bolognaise sauce from my freezer and set it to defrost and reheat, and put spaghetti into my large cooking pot (or cauldron) to boil. Very efficient. Except that I failed to turn down the heat under the spaghetti pot when it started boiling. Despite my affection for the aromas of nature I don’t have a very keen sense of smell. But my vision’s not bad. And when the air around my office started to cloud up with smoke, it gradually began to dawn on me that not all was well in the kitchen. I went downstairs to investigate. I was right: all was not well. The cauldron had boiled dry and the heat continued to pound its base. Visibility throughout much of the house was poor. Have you ever smelled burning spaghetti? I don’t think it will catch on as a perfume. I spent the next several minutes opening doors and windows, eyes streaming, throat rasping. Dinner was hastily improvised. In the end, all was well: I’ve cleaned the cauldron (which took a while), the open mic evening was a success (Margaret runs these shows expertly), and the novella excerpt is duly submitted. I don’t have high expectations of the latter, but it’s a good idea to keep submitting work to competitions, even though you know the judges’ opinions are perforce subjective (assuming the piece you’ve sent to them is written in decent English and you’ve followed the competition rules). Working to competitions keeps you on your toes as a writer. Which reminds me: a short story I sent to a competition a few weeks ago and didn’t get shortlisted is now about to be published in one of The Australia Times magazines, called Thrill Me. If it hadn’t been for the competition I wouldn’t have written the story, so I wouldn’t have the forthcoming publication. I rest my case. Pamela, the other member of our author triumvirate (along with Margaret and me), actually described me as ‘eccentric’ recently. 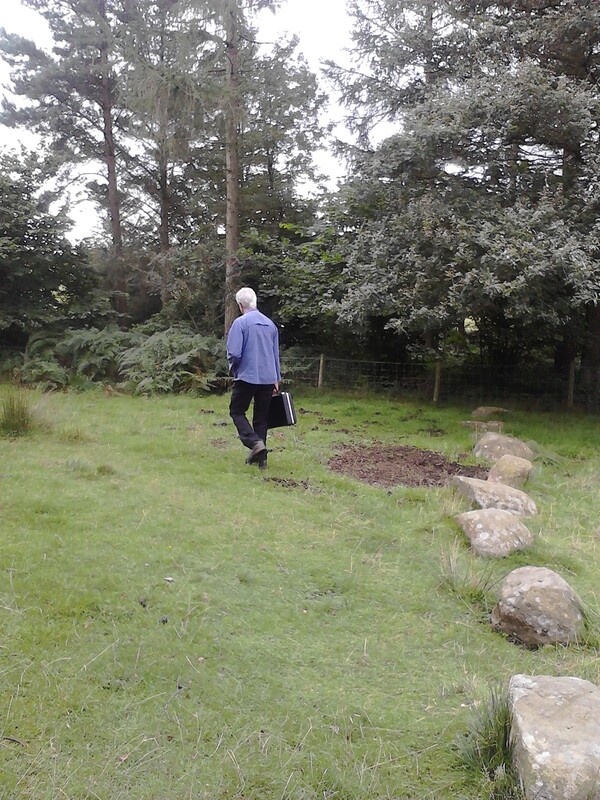 I wasn’t not sure whether to be flattered or otherwise, but to legitimate her epithet she sent a photograph she’d taken of me striding away from the car park on our way to North Lees Hall (see the blog I wrote about following in the steps of Charlotte Brontë). It seems she was deeply moved by the sight of me wearing walking boots (the most sensible footwear for the terrain) while carrying an attaché case (again, perfectly sensible when you’re transporting writing materials). I was inclined to dispute the charge of eccentricity but Margaret supported it, too, so I was outvoted. I had an unfortunate incident with some nitrate free hot dogs not all that long ago. It was quite some time before my kitchen lost the smell, and I have not yet fully reclaimed my pot. I was gardening and cooking… Thankfully my girls caught the error before flames errupted on my burnt offering. Then, this week, I left the kitchen with my tea water heating on the stove and nearly burned my kettle up. I have since decided I need to remain in the kitchen when the stove in in use. A watched pot may never boil, but it will also never burn up. I propose to adopt the same practice from now on. Things that are boiling (or otherwise cooking) require constant supervision lest they get out of hand. Absolutely–when writing (or otherwise distracted), don’t cook! I’ve had stuff boil over, and once burned a pizza beyond edibility… The microwave is nice however, as it stops at an appointed time and then periodically beeps at me until I stop it. Mayhap this is where the cliche of starving writers originated? It isn’t that they didn’t have any food–they just wrecked it before they could eat it! Are we eroding the right to freedom of speech (and thought)? My novelette has been e-published today! Premature spring lifts the spirits, and so does another publishing contract! Mark Henderson on Premature spring lifts the spirits, and so does another publishing contract! Phil (doggerelbanksy) on Premature spring lifts the spirits, and so does another publishing contract! Mark Henderson on Freedom of speech: what are the limits? © Copyright 2010-2017 - Mark P. Henderson. All rights reserved. Site Design by MADink Agency.